So you’ve scanned your PC and found some crap huh? Don’t worry, it happens to everyone. Fixing its pretty simple at this point. Below, you can see we’ve also found some crap on our PC. We’ll show you how to get rid of it. 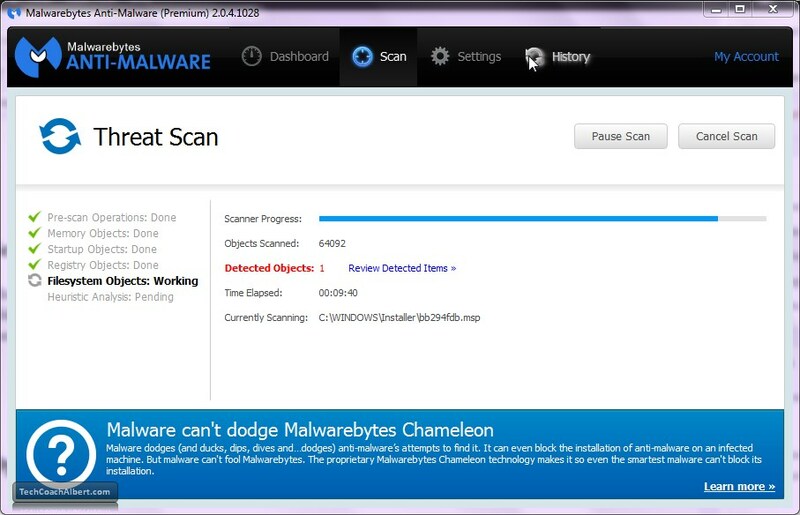 If you’ve got malware, you’ll likely see the screen below during your scan. Detected objects will increase as files are found. Don’t stress out if it gets pretty high. It’ll clean em up! Once the scan is finished, you’ll see this screen below. It will list all the files/infections found. Notice in this case we found 1 instance of malware, but you may have more. To fix, simply locate the Quarantine All box on the lower left corner. Clicking that box will fix all the files and move them to a secure vault. Just in case one of them WAS important, you can recover them one by one. After you hit the Quarantine All button and it fixes the infected files you’ll get some sort of Completed message. In this case, our PC needs to be restarted before it is finished cleaning them. Which that is perfectly fine. Just save any work you were doing, close out of everything else and hit the Yes button to restart your PC and let Malwarebytes finish the work. Now your PC is clean. But, it won’t be clean forever. Make sure you routinely check your PC for malware infections. This is not an automated process (unless you bought the software instead of just using the free version). I would suggest running the scan once a month for light/medium users. And once a week for heavy internet users.